What happens when disaster strikes? We’ve read books about the people involved in natural or manmade disasters and watched movies about them. From earthquakes to terrorist attacks, traumatic events seem natural topics for books and movies. But what is less frequently written about is the disaster from a relief worker’s perspective. Enter After Disasters, a poignant and often harsh tale about the aid workers who rush to the site of an earthquake in India. These are the heroes, the selfless beings who put their lives in danger to try to save those caught in the earthquake. 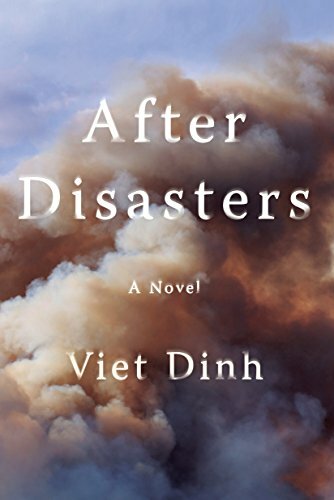 Dinh takes us into the dirty relief camps, underground into the rubble left by the deadly shaking of the earth, even into the hospitals where there are more dead than alive. To be honest, the book is not for the faint hearted. There is much description of pain and death, even more so about loss and tragedy. There are vignettes of grief in the faces of the survivors. There are also vignettes of ugly death in the faces of those who die in the earthquake: the grandmother who cannot accept that her grandchildren have died while she lives, the dead woman pressed on all sides by rocks as her arm-full of bangles is stolen by thieves trying to survive. At first glance, After Disasters reads like a short story collection. The beginning chapters are standalone paintings of each of the main characters in the story. There is Dr. Dev, an Indian doctor with a family from whom he keeps a terrible secret: He is gay in a country where homosexuality is unacceptable. There is Andy, also gay but much more at ease with his sexual orientation as a British firefighter. There is Ted, the third piece of the puzzle, from New York. All three have histories full of heartbreak, and all three meet to help in relief efforts in their own very ways in India. The novel moves back and forth seamlessly between past and present, helping the reader understand what has brought each of the main characters to that Indian soil at that particular moment in time. Some of the characters know each other from past lives, others are strangers who share close proximity in the relief camps. They are all searching for healing, and while a relief camp may be an unlikely place to find it, perhaps they do. Above all, After Disasters helps readers accept the frailty of human life, not only in the physical sense but also in other ways. The heroes who work tirelessly at the scene of the earthquake are heroes not because of super human strength or courage but because of their sense of commitment. They are scared and tired and dirty, but they go on because their work gives them purpose. Each one of them is there because of demons that push them, because of past memories that they want to drown out by this sort of challenging work. In this backdrop, a group of young college students seem the perfect foil to what Dinh is trying to preach. They are eager and excited to be the white saviors to their brown earthquake victims. They follow the workers everywhere, getting in the way, wondering at everything. The workers themselves are more jaded, less eager. There is a contrast there that seems interesting and valuable. They all started out with rosy glasses—Ted imagines himself handing out food to needy families in front of camera crews when he first joins USAID—but somewhere along the way it becomes backbreaking and often unrewarding work. What is perhaps the biggest take-away from the book is the fact of how little human beings are in control of their destinies. The everyday Indians whose lives are destroyed by an act of the gods go back to their meager existence much sooner than the relief workers from America and Europe do. Being in India is a challenge to those who have come to save the victims. From diarrhea to robbery, the white relief workers are faced with their own mortality even as they try to save those affected by the earthquake. Andy dreams of going back to a nice hotel and then back home to forget India. But the Indians themselves have nowhere to go and nothing else to fall back upon. Dr. Dev is one of those left behind, but as a doctor, his life of privilege leaves him still better off than the victims of the earthquake. After Disasters is a story of grit and pain, not unlike the earthquake it follows. Read it at your own peril, but once you do, the pictures it paints in your mind will linger for a long time.